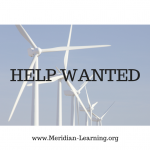 Meridian Learning is seeking guest facilitators for our online conference in December (45 minute commitment) and guest hosts for monthly online office hours from January through May (one hour commitment). Is there an area in which your experience and knowledge might assist aspiring microschool leaders? Is there a topic you are interested in exploring further among our grassroots microschool network? Contact us via email: join@meridian-learning.org.